Don’t Turn Your Back is a game about insane insomniacs trapped in the Mad City. The players take the roles of these troubled souls and have struck a bargain with the Wax King. Whoever does the Wax King the greatest service, measured by candles as victory points, will be allowed to return to the real world while the others will be encased in the Wax King’s throne room. This is the journey to Elsewhere, having taken a distinctly dark turn. It’s very much in the vein of Labyrinth, Through the Looking Glass, or Mirror Mask. Speaking of Neil Gaiman, Neverwhere is a very apt comparison. Or perhaps even Dark City. It’s a little darker than my normal faire and was honestly my biggest concern with the game. I’m happy to say it isn’t an issue. While it’s high on the creepy factor, the game never goes for a scare. Everything is moody and atmospheric but it’s never jarring. I won’t go too deep into this, as the preview version isn’t an example of the final production product, but there are enough pieces in place I can talk about it some. The card design is nice. Each portrait is darkly sinister and thematic. The card size is American board game standard, smaller than the cards for many deck building games that use the American card game/Magic: the Gathering standard. (For Fantasy Flight Games fans, these take green sleeves and not silver.) What was most interesting –and is something that Don’t Rest Your Head can do that other deck builders cannot — is that each player’s deck was color coded. Again, the meeple analogy is apt here. Since cards are placed on the board the way meeples are in a Euro game there needs to be a way to identify whose cards are in which spaces. The four colors are very distinct with a grey, orange, green, and blue. The colors all pop nicely against the dark blacks and bony whites filling in most of the artwork. The main board is sizable but smaller than, say, Marvel Legendary. 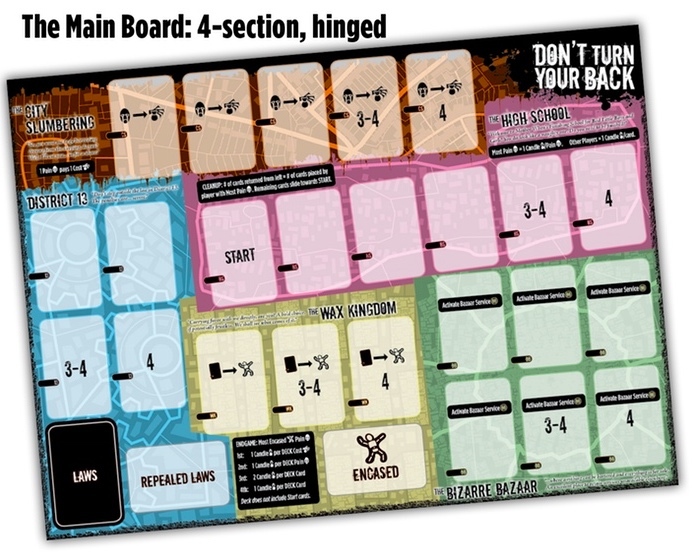 The five areas on the board are all large — this is necessary in part because of the size of the meeple-cards — and cleanly separated visually with both borders and color coding. I particularly liked that each location has the spaces for 2-, 3-, and 4-player games all clearly delineated by printing 3-4 or 4 on spaces that are not used in 2-player games. Each player gets a smaller side board for keeping their decks and discard piles. These were also cleanly laid out, though we all found it awkward that the discard piles are to the left of the decks. All of us kept mixing up those two positions because we naturally discard to the right of our decks. I look forward to seeing the final print quality of the boards and cards. As mentioned, each player has a deck of 25 cards: 8 starting cards and 17 Acquisition cards that can be purchased later. The starting decks are identical except for coloration. In play, each player lays out six Acquisition cards in a tableau that are available for purchase. 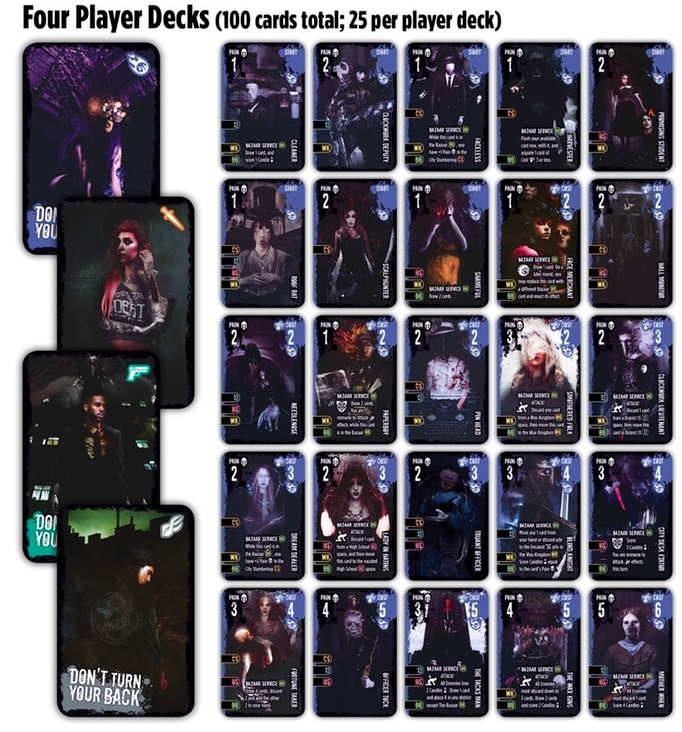 Players may only acquire cards from their own tableau. It seems a non-traditional economy is one of Vogel’s trademarks in game design, as players discarded resources back to a separate resource deck after using them in Zeppelin Attack. There will be eight or nine rounds, depending on the number of players. Each round is broken into four phases: place cards, acquire influence, score, and clean up & draw up. At the start of the game — and at the end of each round — each player draws up to a hand of four cards. Players then take turns playing one card each on an available space in the Mad City. Each card has a number of icons on the left side that indicate where it can be played. No single card can be played in every zone on the board. There are five zones — Bizarre Bazaar, High School, District 13, City Slumbering, and Wax Kingdom — that each have different effects. The Bazaar is the only place where cards played have special effects — card draw, attacks at other players, and special acquisition effects. Thematically this is where you trade favors with the merchants. The High School and District 13 can both directly earn you victory points but do so in wildly different ways. High School has an interesting pacing mechanic where the person with the highest Pain in scores 1 point for each Pain, everyone else scores 1 point per card. District 13 follows the Law that is active for the current round. These cards vary dramatically so it’s always something new and interesting going on in District 13. Keep on your toes because it can get interesting there. The City Slumbering is where players can convert Pain into Influence that can be spent to acquire new cards for their decks. New cards cost between 2 and 6 Influence and space is limited in City Slumbering. But space is always at a premium and it can be very hard to get 6 Pain into the City Slumbering for Mother When. The last zone is the Wax Kingdom. Here players may encase cards to get them out of their deck and to make a bid on scoring at the end of the game. Space is super limited here — always one space fewer than number of players — so it can be a ripe battleground. Once all the players have passed or there are no legal places to play cards, play moves to Phase 2. This is where players convert Pain in the City Slumbering into Influence on a one-for-one basis. Some Bazaar effects give you bonus Pain in the City Slumbering and can be a great boon for buying high point cards when the City Slumbering has filled up early. Buying cards from your tableau works exactly like in Ascension. Once a card from the tableau is purchased, it is placed in the player’s discard pile and immediately replaced before the next card is acquired. Phase 3 is scoring. The High School is scored first and the highest scoring player takes 1 point per Pain. Others score one point per card. District 13 then scores based on the current Law. Phase 4 is clean up and draw up. All the cards in District 13 (including the Law), City Slumbering, and Bizarre Bazaar are removed and put in the discard pile. The High School doesn’t clear out entirely at the end of each round. Instead a number of cards equal to the number of cards that round’s High School winner had in the zone are cleared out. If I had two cards but only 2 Pain and Scott had one card with 3 Pain, we would only remove one card because Scott won. However, if my cards were 2 Pain apiece I would win and two cards would be removed. Look to see which player has the most cards in the High School then remove that many cards, starting on the left and working to the right. This lends a bit of strategy to how many cards any player places in the High School as it can be advantageous to lose the High School in your current turn but have a leg up on the next. Lastly, any cards played in the Wax Kingdom are encased. Players then choose whether they would like to discard any remaining cards in their hands or not before drawing up to 4 cards in hand. A new Law is put into play and the first player card is handed to the next player on the left. The end game triggers when the last Law is discarded from District 13. The game is set up such that each player will have an equal number of rounds as the first player — important for attacks and defense. Our penultimate turn. I played orange. Bonus points are determined by the total Pain value of cards you’ve encased in the Wax Kingdom over the course of the game. The person with the highest total Pain scores the Cost of cards they acquired through play. The second highest Pain scores one point per Pain on cards they acquired. The third highest gets two points for every card they acquired. And the fourth highest scores one point per card they acquired. These points are added to the candles you’ve already scored through game play for a final score. We managed to lap the board both games we played. The first we all scored in the fifties. I came in last at 51. Our second game I was in the high sixties, and the other two players were in the high fifties or low sixties. The gave arrived on Monday and that night I got together with my friends J and Scott. We played two games at our local game shop. The rule book is available online so we were all able to familiarize ourselves with the concepts before sitting down to play. Initial setup went quickly. There isn’t really any deck construction and separation like with Marvel Legendary as the decks never get shuffled together. We jumped into the game and finished the first game a little over an hour later. The second game went a bit quicker, slotting in nicely in the 45-60 minutes of game play that the box suggests. The Law cards acting as a timer worked very well and the end game even sneaked up on us rather unexpectedly in the second game. We all had a good time and were champing at the bit for another game but it got late and we’re all grownups with responsibilities and crap. Scott’s leaving town for business but I hope to get a game or two in with J later this week. 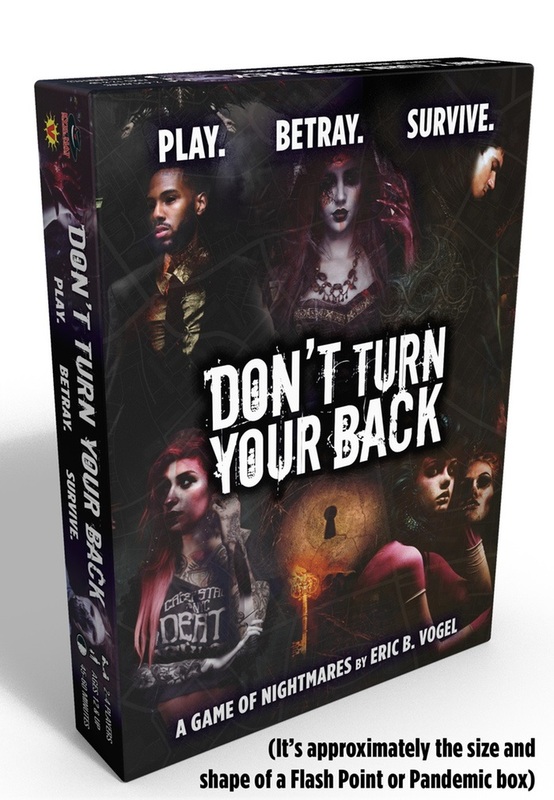 Don’t Turn Your Back is a really solid game that offers a unique, refreshing take on both the deck building and worker placement genres of games. I like it quite a lot for the depth of the strategy and the simplicity of setup. If my wife likes it, I can see it becoming one of our staples. Eric B. Vogel has done a stupendous job with this game. His prior outing with Evil Hat, the aforementioned Zeppelin Attack, is a light, silly deck builder that focuses on PvP. Don’t Turn Your Back is more about worker placement and using your tools to their greatest effectiveness. The mechanics are much more consistently engaging than a standard deck builder. Since players take turns placing a single card each, there is very little downtime between plays. Where many deck builders feel like several single-player games happening around or at each other, Don’t Turn Your Back feels very much like a multi-player game as the board state changes after every incremental action. The depth of choices is also deeper than most deck building games. I’m less familiar with worker placement games but the choices feel much more like Lords of Waterdeep than DC Comics Deck Building Game. You don’t just acquire and destroy. You need to balance acquiring cards through the City Slumbering with gaining points in the round from District 13 and the High School against encasing cards for a smoother deck and using the Bizarre Bazaar to take special actions. Like any worker placement game, there’s a rush to get workers in your preferred locations and you may be cut off from the strategy you’d hoped to enact that round. Once or twice I locked Scott out of District 13, which really hurt his engine. There were a few times when J played an attack card that really hosed me. There aren’t many attacks in the game but there are a few that open up new tactical choices – notably cards that let you replace an existing card in another zone. One thing I appreciate about the design here is that — unlike a normal worker placement game — the spaces in each zone are all identical. The differences come from the workers themselves, and which workers you have in your deck is something you have at least partial control over. Each card in a deck has a unique combination of Pain, Cost, Bazaar effects, and legal zones. All of those traits are useful in obvious and non-obvious ways. This means the choices available to you on one turn will likely not be available on the next because cards are discarded and drawn back up with an initial hand size of four. Higher Pain values are useful in the High School, City Slumbering, District 13, and in the Wax Kingdom — though Pain only matters at the end of the game in the Wax Kingdom. Pain is the currency used to win control of District 13 and the High School and it converts into Influence that can be used to gain favors from Nightmares in your Acquisition deck. These favors are, in turn, more powerful than the starting cards in your deck. Cards that can be played in the Bizarre Bazaar ignore Pain in favor of some sort of Bazaar effect. My favorite Bazaar effect is the Face Merchant. Its immediate effect is to draw one card but it also lets you discard the Face Merchant later that turn to play a new Bazaar card on that space. What I like about that is the earliest spaces to go in our games were the Bazaar spaces – actions can be hugely effective. Playing the Face Merchant early is not only a null play from a cards-in-hand perspective, but it also reserves you the ability to play a Bazaar card (and all attack cards are Bazaar cards) late in the round, potentially changing the board in a dramatic way. My one and only real complaint is that the Bizarre Bazaar always fills up first. 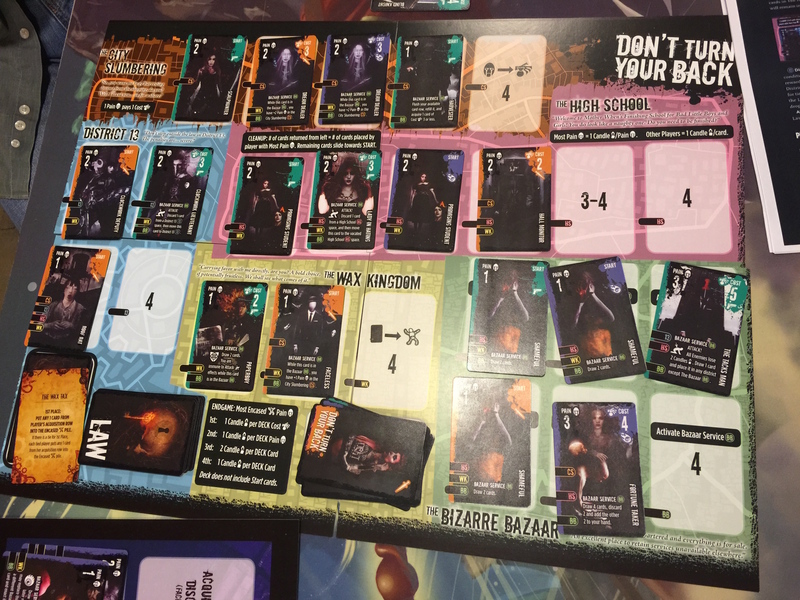 It’s a rush to get actions and then the other zones fill up as people go for points, Influence, and encasing cards. This isn’t necessarily a bad thing, just makes rounds seem very predictable in that every rounds it’s a rush to one zone followed by a diaspora to the others. I wish there were more of an incentive to get in on some of the other zones early. I got this preview because I am a freelancer working for Evil Hat Productions. It was free on the condition that I play it and write about it in a public space before the end of the Kickstarter. The nicely composed, properly lit images are from the Kickstarter page and belong to Evil Hat, used here with permission. The poorly lit cell phone shot of the game in progress is mine. Someone spotted a typo on the preview digital board where the rules for clearing the High School were incorrect. They’re right in the rules book but wrong on the board. My group followed the board. I’ve struck out the incorrect description and replaced it above. This entry was posted in Actual Play, Reviews. Bookmark the permalink.